WASHINGTON -- After five years as the chief promoter of the false idea that President Barack Obama wasn't born in the United States, Donald Trump admitted on Friday that the president was - and claimed credit for putting the issue to rest. "President Barack Obama was born in the United States, period," Trump said in brief televised remarks. "Now we all want to get back to making America strong and great again." But as Trump sought to put that false conspiracy theory to rest, he stoked another, claiming that the "birther movement" was started by rival Hillary Clinton. There is no evidence that is true. "Hillary Clinton and her campaign of 2008 started the birther controversy. I finished it," Trump said. "I finished it, you know what I mean." Trump spoke against a backdrop of veterans in a sprawling ballroom at his new Washington hotel. His statement of a few seconds came only after a lengthy campaign event featuring military officers and award winners who have endorsed him. Trump did not address the issue until the end of the event, turning it into a de facto commercial for the GOP candidate, as the major cable TV networks aired the full event live in anticipation of comments Trump had hyped hours before. "I'm going to be making a major statement on this whole thing and what Hillary did," he told the Fox Business Network. "We have to keep the suspense going, OK?" Clinton herself said Friday that Trump owes Obama and the American people an apology for his role as a leading "birther" questioning the president's citizenship. Speaking at an event with black women, Clinton said that Trump's campaign was "founded on this outrageous lie. There is no erasing it in history." She said Trump is "feeding into the worst impulses, the bigotry and bias that lurks in our country." The birther idea, which he now denies, provided Trump with his entry into Republican politics and for years has defined his status as an "outsider" who is willing to challenge convention. As late as Wednesday, he would not acknowledge that Obama was born in Hawaii, declining to address the matter in a Washington Post interview published late Thursday night. "I'll answer that question at the right time," Trump said. "I just don't want to answer it yet." Clinton seized on Trump's refusal during a speech Thursday night before the Congressional Hispanic Caucus Institute. Hours later, campaign spokesman Jason Miller issued a statement that suggested the question had been settled five years ago - by Trump. "In 2011, Mr. Trump was finally able to bring this ugly incident to its conclusion by successfully compelling President Obama to release his birth certificate," Miller said. "Mr. Trump did a great service to the president and the country by bringing closure to the issue that Hillary Clinton and her team first raised," he added. "Inarguably, Donald J. Trump is a closer. Having successfully obtained President Obama's birth certificate when others could not, Mr. Trump believes that President Obama was born in the United States." The facts of Trump's actions do not match Miller's description. Trump repeatedly questioned Obama's birth in the years after Obama released his birth certificate. In August 2012, for example, he was pushing the issue on Twitter. "An 'extremely credible source' has called my office and told me that BarackObama's birth certificate is a fraud," he wrote. 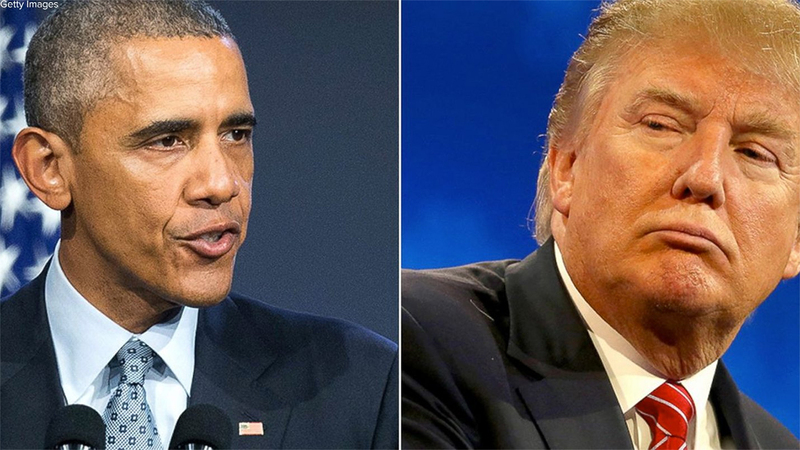 Trump's comments speculating on Obama's birthplace have been seen by many as an attempt to delegitimize the nation's first black president, and have turned off many of the African-American voters he is now courting in his bid for the White House. On Friday, Obama jabbed at Trump, saying "We're not going to be able to solve our problems if we get distracted by sideshows and carnival barkers." "I was pretty confident about where I was born. I think most people were as well," Obama said during a meeting about his trade agenda. Miller's claim that Clinton launched the birther movement during her unsuccessful primary run against Obama in 2008 is unsubstantiated and long denied by Clinton. The theory was pushed by some bloggers who backed Clinton's primary campaign eight years ago, but Clinton has said Trump "promoted the racist lie" that sought to "delegitimize America's first black president."